With one week to go until Sign & Digital UK 2018 (SDUK), the team at Faversham House has announced the latest exhibitor news, product launches and competitions set to be showcased at this year’s event. 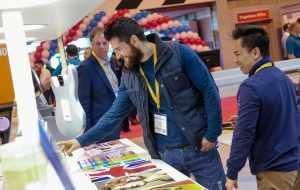 Returning to the NEC Birmingham from 24th to 26th April 2018, the industry leading trade show will once again bring a range of innovative technologies and equipment aimed at the visual communications sector. 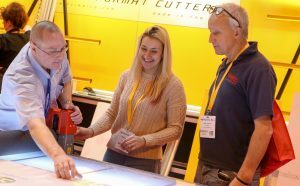 The 2018 show theme, Creativity Brought to Life, will see the event’s legacy of innovation continue; presenting visitors with new interactive features, an enhanced free-to-attend seminar programme and practical live demonstrations showcasing the latest technologies, products and services. Sign & Digital UK will give visitors the opportunity to gain industry insight from experts and inspirational speakers including celebrity retail consultant, Mary Portas. Here is a preview of just some of the many product launches and prize giveaways you can expect to see at this year’s event. The Antalis stand will be modelled as a luxury retail store with a spring theme and will showcase Antalis’ full portfolio of visual communications solutions through a tasteful seasonal design. The ‘store’ will be split into three distinct collections – vehicle and wrapping, POS and signage and décor – designed to showcase Antalis’ full range of rigid and flexible media in application. Bergman / Art Neon will display the new LED Neon Flex on Stand G42. A high flexibility, professional solution for indoor and outdoor use with horizontal and vertical bending, high dust and waterproof protection (IP67) and high UV and salt resistance. CMYUK (J10) will be showcasing the Massivit 1800 3D printer – a 3D printer of unique size capability, and of commercial speed performance that the company says is “unrivalled”. The Massivit 3D printer will enable specialists within the format graphic display market place the opportunity to create huge high-impact models. Corel will showcase CorelDRAW® Graphics Suite 2018, the latest version of Corel’s industry-leading design collection, packed with powerful features and highly anticipated updates to help graphics professionals transform their creative ideas into professional, visually stunning designs. Eptanova will showcase its Light Diffusing Ink, a product for screen printing on optically transparent glass, PC and PMMA panels that is visible only through a dedicated LED illumination. The potential of this product and its practical applications will be of particular interest to signage and décor industries. Eurobond Adhesives Ltd will launch the MagneTape® range of self-adhesive backed magnetic tapes for mounting printed media in retail, POS, warehousing and offices. GRAFITYP UK Ltd will showcase the Océ Colorado 1640, which is a 64″ roll-to-roll wide format printer built on the revolutionary new Canon UVgel technology. The Océ Colorado 1640 boasts excellent printing capabilities, with speeds up to 159m2/hr for applications such as billboards and outdoor banners. For the first time ever, Hybrid will be showing the entire range of Mimaki’s UCJV Series LED UV printer/ cutters, with both the UCJV300 and UCJV150 on display together at the exhibition. Mimaki’s key solvent printers and printer / cutters will also play a starring role with a number of innovative and popular systems on display. Modular Grid Signs will have a beautifully illuminated, light-focused stand where they will launch Modular Grid Signs; a new and innovative form of Business Signage. Stadur will showcase the VISCOM MAGNETIC, a lightweight foam board. This new product consists of VISCOM SIGN SF with a magnetic foil on one side. The magnetic side allows the adherence of ferrous paper/ foil and is therefore suitable for easily exchangeable advertisements and long-standing applications, especially for shop design. CADlink (E42) will run a prize draw to win a free software license. Simply drop off a business card or fill in a form at the CADlink stand for the chance to win. Eurobond Adhesives Ltd (G66) will host a business card draw. One lucky winner will receive an iPad. Justprint Ltd (E72) plans to offer a special discount to anyone who makes an online registration at cheapestbanners.co.uk during Sign & Digital UK. First prize: Win an exclusive Renault Sport Formula OneTM Team experience for two during the 2018 Formula 1 Hungarian Grand Prix (26th – 29th July). The package will include an additional insight with the team’s head of paint and graphics on Thursday evening. Flights and hotel accommodation included. Second prize: Win an exclusive Renault Sport Formula OneTM Team experience for two during the 2018 Formula 1 Rolex British Grand Prix (8th July 2018). Parking and overnight stay at Whittlebury Hall included. Third prize: Money can’t buy signed memorabilia plus a VIP factory tour and lunch for two. Automatic Letter Bender will hold a letter bending demonstration using the ALB- 02 Combo machine. Automatic Letter Bender will also showcase the accuracy and precision of the CNC Router Black Series MTC with hybrid servo machine with a metal cutting demonstration. Textile Printing Live has been designed to respond to the design industry’s ever-increasing interest in printing textiles. SDUK visitors will be able to try their hand at creating printed textile products that they can personalise and take home. 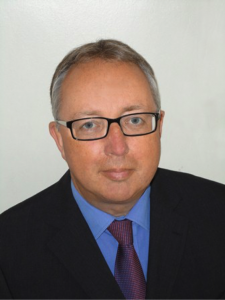 Onyx Graphics will run sessions to help printers increase profit margins, reduce waste and improve their understanding of print workflow techniques using the Onyx HUB as a solution. Vehicle Wrapping Live Spandex will host wrapping demonstrations throughout the show. Visitors will be able to see and ‘have a go’ at wrapping with a wide range of colours and textures from 3M, Avery Dennison, ORAFOL, Arlon and ImagePerfect. Covering vinyl, wallcovering and magnetic substrates, these two live demonstrations are aimed at companies who have large format Inkjet technology and who are looking to get a complete overview of all aspects of use and application as well as practical hints and tips on installation from the experts. Roland DG will be hosting demonstrations of its TrueVIS VG-640, TrueVIS SG-300, SOLJET PRO 4XR-640 and VersaSTUDIO BN-20 printer / cutters, each designed to accommodate the needs of different graphics professionals. Entry to the show for visitors is free – pre-register at www.signanddigitaluk.com.